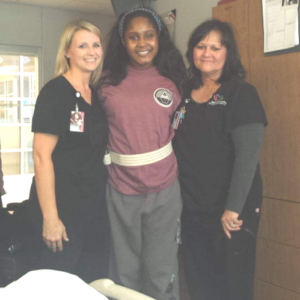 Just days after her sweet sixteen birthday celebration, Alize Bradford went to the doctor with what seemed to be an ordinary virus. Sent home to rest and wait it out, her symptoms worsened. She was then admitted to The Children’s Hospital – OU Medicine where she was diagnosed with Corona virus and pneumonia. Alize was moved to the Pediatric Intensive Care Unit (PICU) and subsequently placed on a ventilator and into a medically induced coma. Her condition was so severe doctors placed her on an ECMO machine to oxidize her blood and she received several transfusions. While experiencing acute respiratory distress and pulmonary hypertension, Alize remained on the ventilator and ECMO to increase her chances of survival. While doctors monitored Alize around the clock, her mother prayed. Your membership into the Hospital’s new monthly giving program, 1898 Club, gives patients like Alize the chance to transition from hospital to home. To join the club today click here.